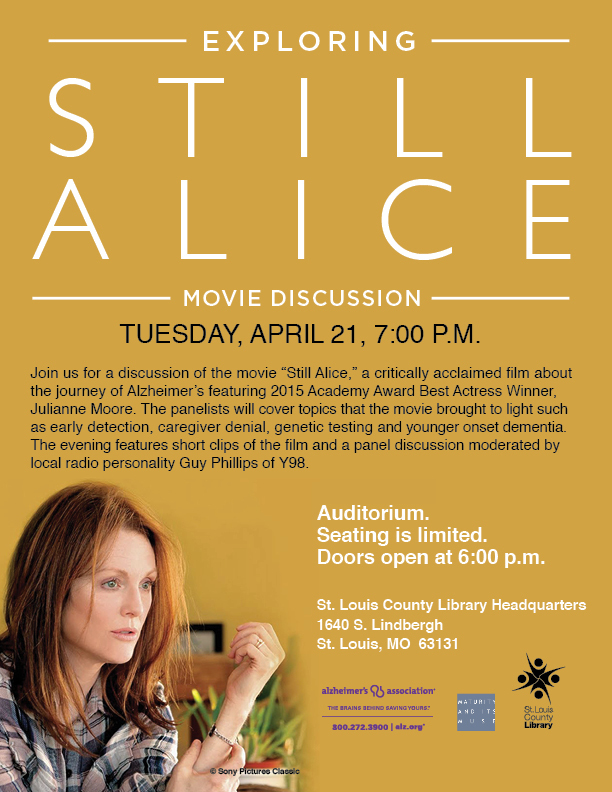 a MaturityMuse, Maturity and Its Muse, is partnering with the St. Louis County Library and the Alzheimer’s Association, St. Louis to present Exploring “Still Alice,” an evening of film clips and a panel discussion. The program, to be held at 7pm, Tuesday April 21 at the St. Louis County Library Headquarters (additional address info on the attached flyer) features a panel discussion moderated by Guy Phillips of Y98. Additional panel members are: David Carr, MD, an associate professor of medicine and neurology, and clinical director for the Division of Geriatrics and Nutritional Science, Washington University in St. Louis. His areas of specialty include geriatric medicine and Alzheimer’s disease, a board member of the Alzheimer’s Association who has younger Onset Alzheimer’s, his wife and care partner, and Stephanie Rohlfs-Young, MSW, Vice President of Programs, Alzheimer’s Association. Admission is free. I hope you will attend and/or share this with folks you know who could benefit from the screening and conversations along with the opportunity to ask questions.